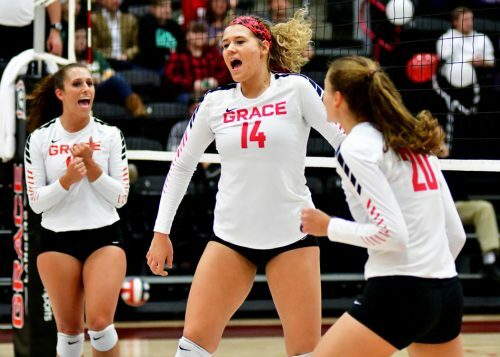 WINONA LAKE – Grace’s volleyball team dropped its Senior Night match to Goshen, 3-1, on Wednesday. The Lady Lancers had 64 kills in the four-set match, but Grace’s miscues cost them. 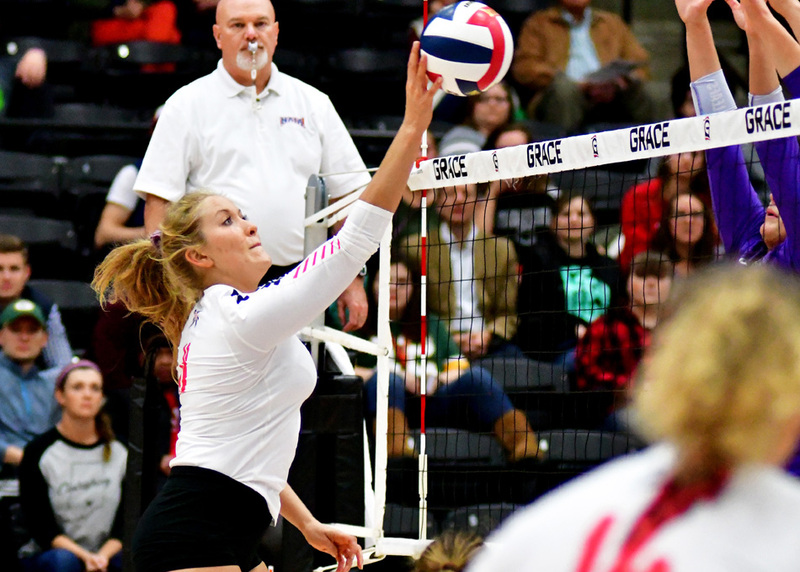 Grace committed 22 attack errors, 6 serving errors and 4 blocking violations. Goshen pulled out a pair of 25-23 wins to help upset the Lady Lancers (19-15, 11-7 Crossroads League). The Maple Leafs (9-25, 3-15 CL) won 25-23 in both the first and third sets. Caylie Teel rises for a kill attempt for Grace. The Lady Lancers managed to even up the match with a 25-21 win in the second set, but Goshen won again in the third set. Grace led 19-16 late in the third game, but Goshen rallied to win nine of the last 12 rallies to take the set. The fourth set belonged to Goshen. Grace had its worst offensive output with seven attack errors and a .079 attack percentage, and the Maple Leafs had 14 kills on just two errors to seal the match 25-16. 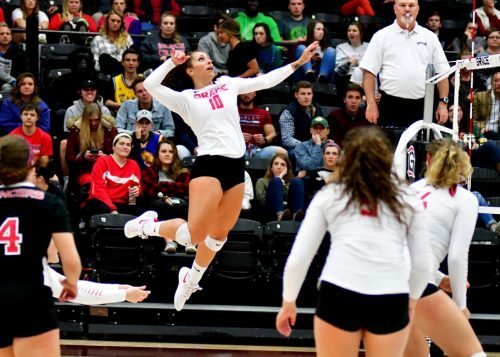 Gabbey Harrington, filling in for All-American setter Alexa Hill, had a career-best evening. Harrington amassed 52 assists, 11 digs and 5 kills in a strong outing. Grace’s four seniors all played important roles in the match. 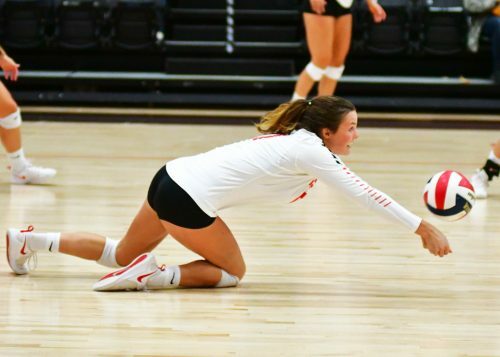 Marta Bleed and Kelsee Zuidema tied for match honors with 16 kills, Caylie Teel notched a double-double with 13 kills and 15 digs, and Kelsey Smith added five kills on a .333 percentage. Gina Novotny led all players with 26 digs, Caroline Mayer had 12 digs, and Makaela Lochmueller chipped in eight kills. The regular season officially ended on Wednesday night for Grace. The Lady Lancers transition to postseason play, starting Saturday. Grace, the No. 4 seed in the upcoming Crossroads League Tournament, will host Taylor on Saturday at 7 p.m. in the quarterfinals at the Manahan Orthopaedic Capital Center. Caroline Mayer digs out a Goshen attempt. Kelsee Zuidema celebrates a kill against the Maple Leafs.